Okay, Okay I am being a little dramatic. I will start off with some positives about today’s 18 mile long run. #1. I felt really, really good up until mile 17 #2. I am getting soooo excited for this marathon #3. We saw some amazing views, and it is truly amazing to be able to take in the country side in the way we have been, I love it #4. Going along with the country runs..I now know about 4 different pumpkin patches that I want to head to! #5. We finished strong and we are realizing how much easier up to 15 miles is getting, its weird but oh so cool! 10 miles is now a breeze to us…and 5 miles is like a walk in the park! Alright did I do a good job starting off in a positive way for this post!? I think so. Now on to the “drama”…. 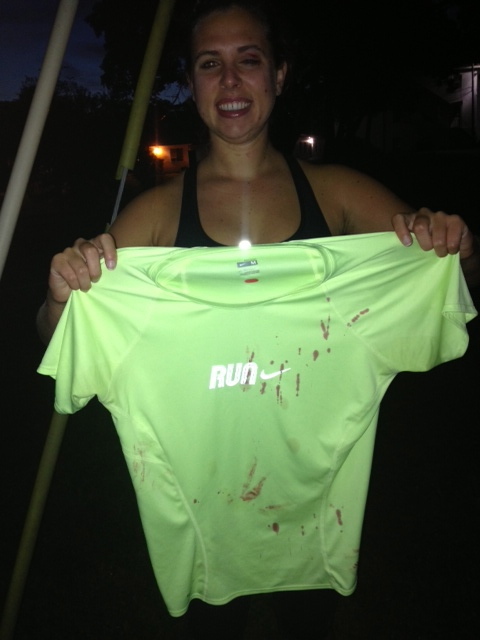 This happened to poor little RR at mile 1. Yes, thats right mile 1! It was quite dark out at 6am this morning, and we were running down a slightly narrow street and a car was coming and RR sort of leaned into the branch and it scratched her eyelid up top!! 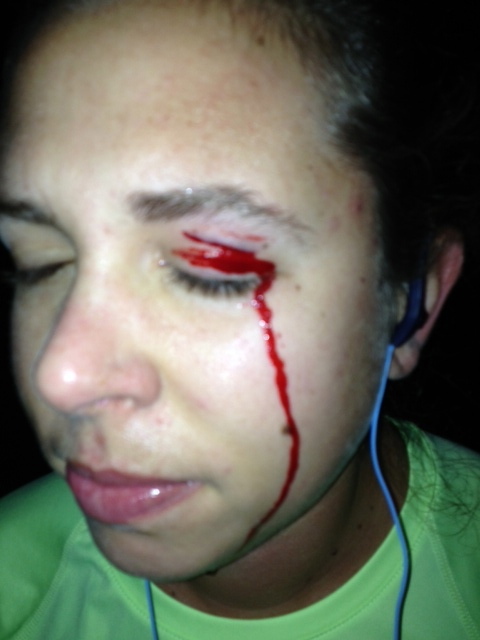 At first when she asked me if it was bleeding, typical me goes “nah, you’re fine”…!!! I am an idiot clearly. I mean but it was dark! After we examined her and called Mr. RR and confirmed that it was okay for chickie to finish 17 more miles we had to take some pics to document this craziness!! Don’t you think she would make an awesome Zombie for Halloween!? 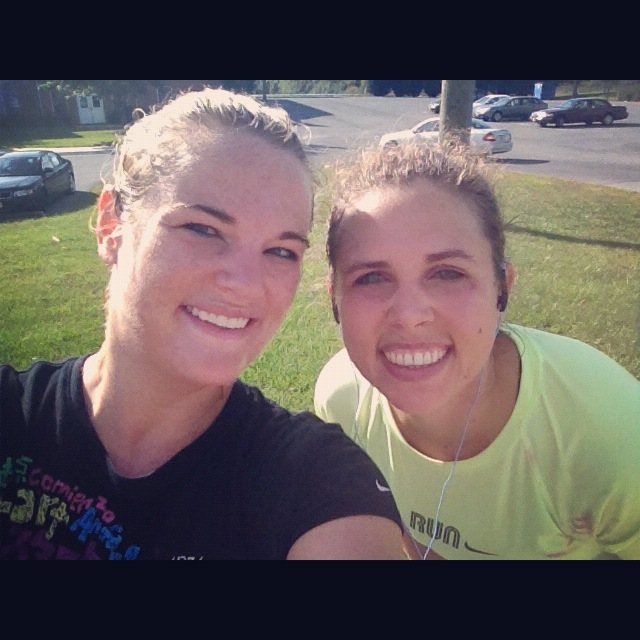 We always look so happy after our long runs…feeling very accomplished! The reason I say “hilly” was because RR had two runs we could choose from a “rolling hills” run or a “climb up the mountain” run…aka one big huge hill or lots of little ones. I chose the mountain climb. HOLY HELL. Let me just say this was the first 6 miles of our run and I thought I was going to have to tell RR goodbye and leave to go back home..I was barely moving up this mountain…BUT we made it!! Yay us! I did a lot of mental speaking to myself such as “gotta earn the downhill”….”this is good for marathoners”….”what doesn’t kill you makes you stronger”….then it changed to “I hate running”….but on that downhill I must’ve had the BIGGEST smile ever…it felt SO DAMN GOOD! 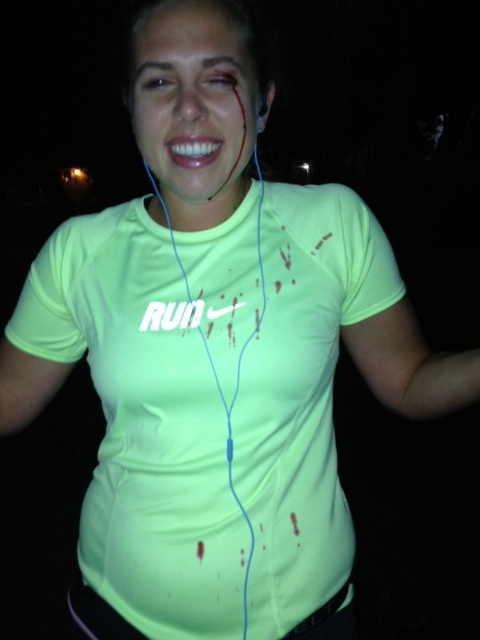 that is why you do hills…. 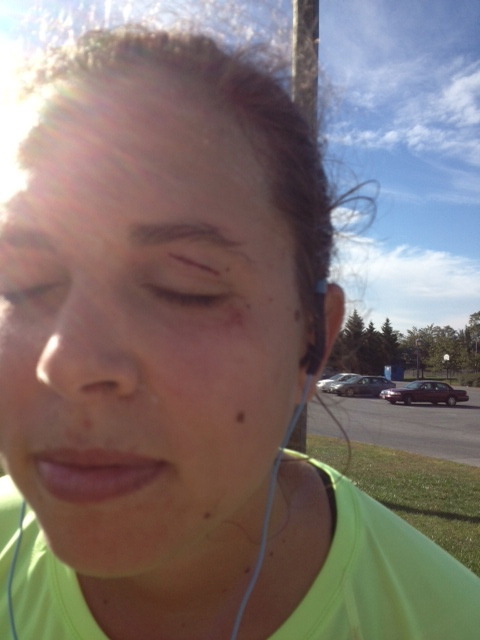 We decided since we had a hard run, a branch poke an eye, a dog try to attack us, a hill that was larger than a black diamond ski slope….we deserved some IHOP. 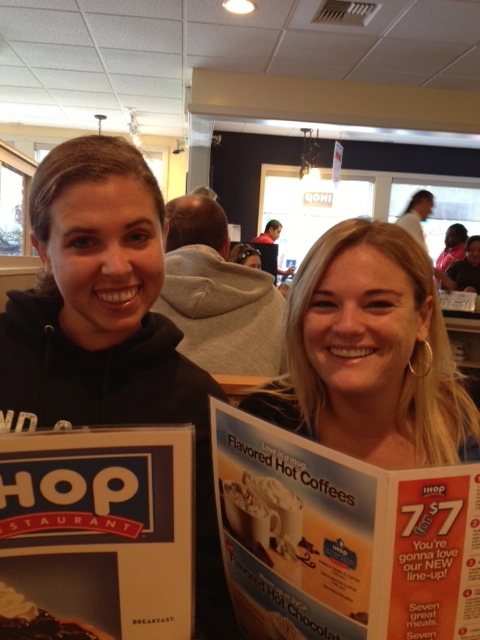 I guess if we are going to eat four pancakes, eggs, ham and hash browns we better do it after an 18 miler. Picking out our delicious breakfast! I had carrot cake pancakes (they were AMAZING, but didn’t make the blog, sorry). 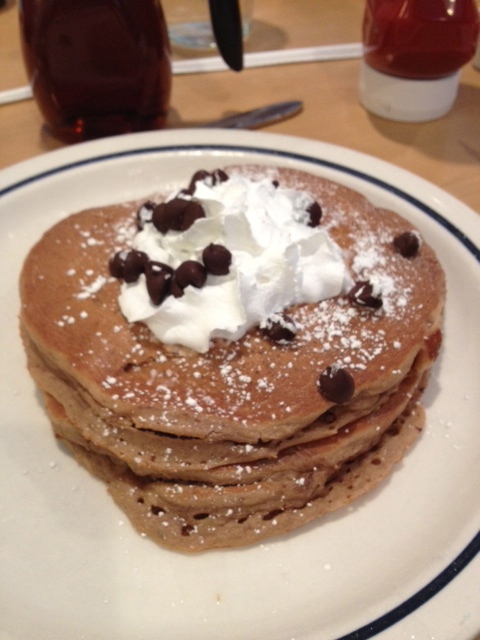 And I had to try their chocolate chip pancakes…I may never make my own pancakes again! 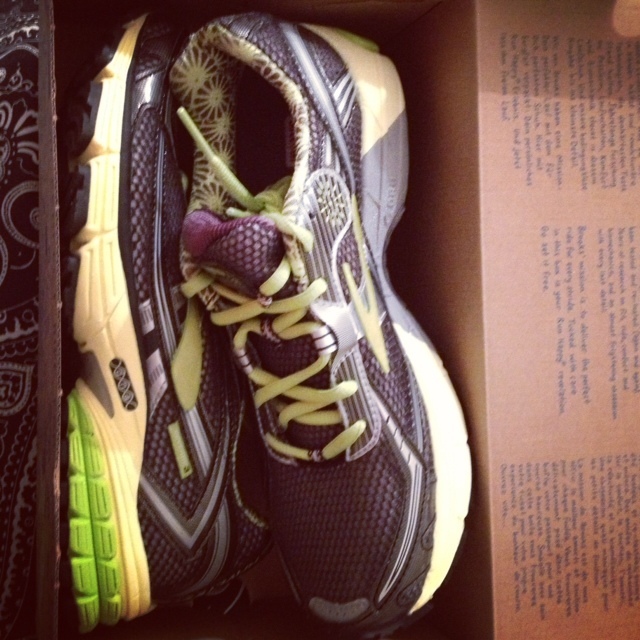 Today I am grateful for….my new Brooks Ravenna 3’s that arrived yesterday….